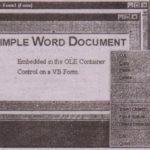 Microsoft Word provides numerous objects which you can use to program any action that can be carried out with menu commands. For example, you can open a document, count words and characters, replace certain words in it, and save it back on disk without user intervention. You can actually do all this in background with even displaying Word’s window on the Desktop. The top-level Word object is the Application object, which represents the current instance of the application. You can use the Application object to access some general properties of the Word’s window including its Visible property (to make the application visible or not) and the active document (to switch to one of the open documents). Under the Application object is the Documents collection, which contains a Document object for each open document. Using an object variable of Document type, you can access any open document (or open and create new documents). The most important object that each document exposes is the Range object, which represents a contiguous section of text. This section can be words,. part of a word, characters, or even the entire document. Using the Range object’s methods, you can insert new text, format existing text (or delete it), and so on . • The Characters collection, which is made up of Character objects that represent individual characters. For example, you retrieve all the paragraphs of a document through the Paragraphs collection of the Document object. If you apply the same method to the current selection (represented by the Selection object), you retrieve all the paragraphs in the selected text. In the following section, we arc going to explore the members of ·the basic objects exposed by Word and show you how to use them from within your Visual Basic code. ThefileName argument is the document file’s path name. The argument template specifies the name of a template file to be used as the basis for the new document. The new template argument is a Boolean value. If it’s set to True, Word creates a new template file. After the execution of this statement, the MyNotes.doc document becomes the active one, and your code can refer to it through the object Application.ActiveDocument. All the arguments are optional and they correspond to the properties you can set on Word’s Print dialog box. The Background argument is an optional value that specifies whether the printout will take place in the background, and this argument is usually set to True when we’re automating applications. When you use VBA to instruct Word to print a document, the process of spooling the document to the printer queue is not instantaneous. If you attempt to quit the application immediately after calling the Printout method, Word will inform you that quitting at this point will cancel the printout. To make sure that the document has been spooled (which means you can safely quit Word), you must set up a loop that examines the value of the BackgroundPrinting property, As long as this property is not 0, the application is busy spooling the document. After all the information has been queued, you can quit Word. 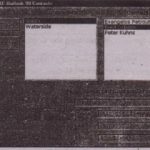 A related property of the Document object is the Saved property, which returns a True/False value indicating whether a document has been changed since the last time it was saved. Use the Saved property in your code to find out whether you must call the Save method before you quit the application. 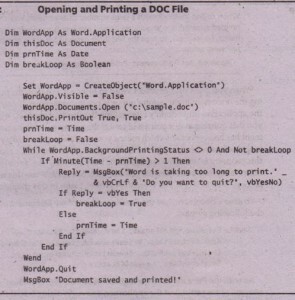 The following code segment opens an existing document, prints it, and then quits. Notice that I use the Createobject() function to create a new instance of Word. I did this to simplify the code. You’ve already seen how to contact the existing instance of Word if it exists. The BackgroundPrintingStatus property returns a non-zero value while Word is spooling the document. While the loop is executing, the application won’t quit. Because of hardware errors, this process may never end, and we don’t want our application to lock up. Every minute, the program asks the user whether they want to wait or not. 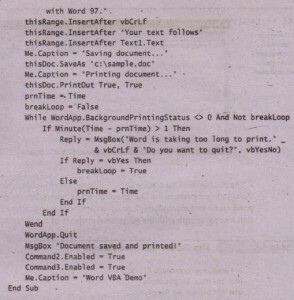 If the user decides to terminate the printout, the breakLoop Boolean variable is set to True from within the loop’s code and the While’loop breaks. This approach is rather simplistic and takes up too much computer time, It would be far more efficient to place a Tuner control on the Form and monitor printout’s progress from within the Timer event. You can then access the Range object’s properties to manipulate the third paragraph. Once a paragraph (or any other piece of text) is selected, you can apply all types of processing to it (e.g., edit it, move it to another location, format it). 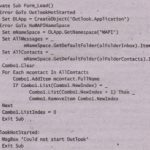 The Select method of the ActiveDocument object selects the entire text. The selected text is then converted to a Range object, so that the Range object’s methods can be applied to it. The InsertBefore and InsertAfter methods place some text before and after the Range object. • Create a new document. • Insert some text and format it. • Count the. paragraphs, words, and’ characters in the new document and display them in a message box. These actions take place from within the Visual Basic application while Word is running in the background. The user doesn’t see Word’s window, not even as an icon on the taskbar. The new document is saved as C:\SAMPLE.DOC and you can_open it later with Word and edit it. The code behind the Create DOC File button is straightforward. 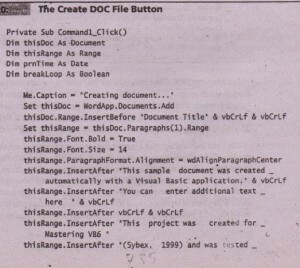 It uses the Paragraph property of the Document object to manipulate the text (insert new paragraphs and manipulate them). Notice how it changes the alignment of the first text paragraph with the Alignment property of the Paragraph object. 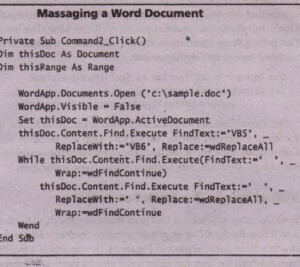 The Massage DOC File button shows you how to manipulate the text in a Word document through OLE Automation. the initial text contains multiple spaces between words that shouldn’t be there. To reduce multiple spaces to single space characters (a task in editing), you can use the Find & Replace dialog box. The WordVBA Application does the same by calling the Find method. The Find method accepts a large number of arguments, most them optional. For the WordVBA application we must specify the string to search for and the replacement string.The program searches for two consecutive spaces, and if found, replaces them with a single space. The process can’t end here, because the document may contain three consecutive spaces that need to be reduced to two. So the Find & Replace operations must continue. As long as the code finds two consecutive spaces, it repeats the replace operation and reduces them to one space. 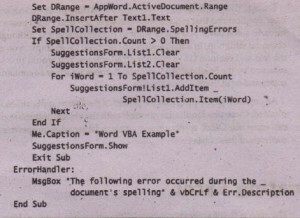 One of the most useful features of Word (and of every Office application) is its ability to spell-check a document, This functionality is also exposed by Word’s VBA objects, and you can borrow it for use within your Visual Basic applications. This is not only possible, it’s actually quite simple. To call upon Word’s spell-checking routines, you need to know about two objects: the ProofReadingErrors collection and the SpellingSuggestions collection. ORange is Range object (a paragraph or an entire document). The second Me populates the SpellCollection variable with the misspelled words. You can then set up a For Each Next loop to read the words from the collection. The second line.retrieves the suggested alternatives for the word android. 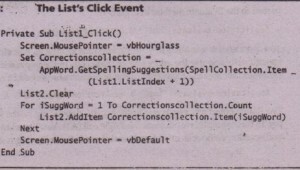 To scan the list of suggested words, you set up a loop that retrieves all the elements of the Correctionstlollection collection. The example in the next section demonstrates the use of both methods from within a Visual Basic application. 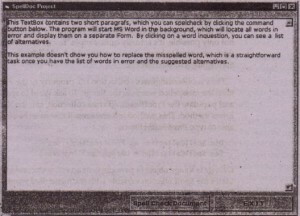 spellDoc is an application that uses Word’s methods to spell-check a document. You’ll find the SpellDoc application in this chapter’s folder on the CD. 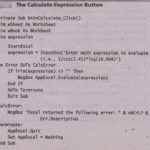 The application’s main Form, shown in Figure 14.15, consists of a multi-line TextBox control on which the user can enter some text (or paste text from another application) and spell-check it by clicking the Spell Check Document button. The application will contact Word and request the list of misspelled words. 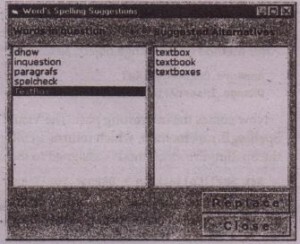 The list of misspelled words will be displayed on a different Form, shown. The ListBox control on the left shows all the misspelled words returned by Word. Word Cannot only locate misspelled words, but suggest alternatives as well. To view the alternate spellings for a specific word, select the word in the left list with the mouse. To replace all instances of the selected misspelled word with the selected alternative, click the replace button. You can design your own interface to allow the user to select which and how many instances of the misspelled word in the original document will be replaced. 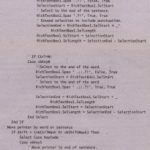 The SpellCollection variable is a collection that contains all Ute misspelled words, and the CorrectionsCollection variable is another collection that contains the suggested spellings for a specific word. The CorrectionsCollection variable’s contents are assigned every time the user selects another misspelled word in Word’s Spelling Suggestion window. 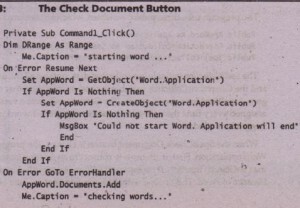 When the SpellCheck Document button is clicked, the program contacts the Word application. First, it attempts to connect to an existing instance of.Word with the GetObject() function. If no instance of Word is currently running it starts a new instance of Word. This is done with the following lines in Code. The following lines add the words contained in the SpellCollection variable to the left.list of the second Form and then they display the Form. On the second Form of the application, all the code is concentrated in the Words in Question list’s Click event. Every time an entry in this listBox is clicked, the code calls the App Word object’s GetSpellingSuggestions method, passing the selected word as an argument. Notice that we add 1 to the list’s Listlndex property to offset the fact that the indexing of the elements of a collection starts at 1, while the indexing of , the elements of a listBox control starts at O. The GetSpellingSuggestions method returns another collection with the suggested words, which are placed in the second ListBox control on the Form with the following statements. 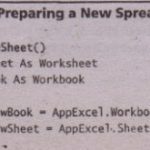 The SpellDoc application can become the starting point for many custom Visual Basic applications that require spell-checking, but don’t need powerful editing features. In some cases, you might want to customize spelling, although it’s not a very common situation. In a mail-aware application, for example, you can spell-check the text and exclude URLs and e-mail addresses. You would first scan the words returned by the SpellingErrors method to check which ones contained special characters and omit them. As you can see, tapping into the power at the Office applications isn’t really complicated. Once you familiarize yourself with the objects of these applications, you can access the Office applications by manipulating a few properties and calling the methods of these objects.